While many see Thanksgiving as a day to roll out of bed and fill their bellies with turkey, stuffing, and grandma’s famous pumpkin pie, there are others who like to have a more active start to the day. Here is your definitive list of all area Thanksgiving-related races that will have you feeling less guilty about going back for seconds on turkey day. Prizes: Adult male, adult female and master winners will receive a turkey for Thanksgiving. Best-dressed participant, largest number of family members participating, and oldest and youngest participants will receive a homemade apple pie. Click here to register. Registration ends today at 11:59 p.m.
Prizes: Medals for top three male and female 5K and 8K finishers. Rewards for top finishers in each age group. There will be a costume contest before the races start. Prizes: Awards ceremony for top three male and female winners and top male and female masters winners for 8K race. 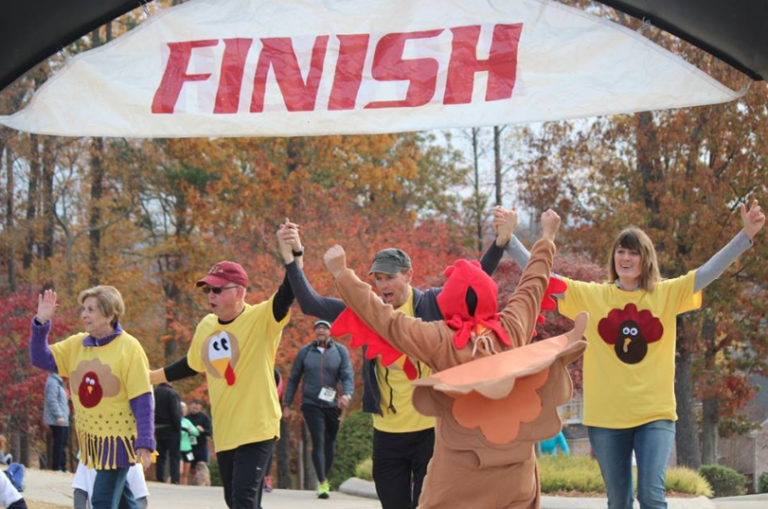 Anyone who finishes the 8K run will receive a turkey trot medal. 5K run/walk and one-mile fun run participants will receive a commemorative medal. All tot trot participants will receive a special award. Click here to register. Registration closes at 6 p.m. on 11/19. Prizes: Awards for top three overall male and females 10K and 5K racers. Awards for top three overall 15K runners. First place in each age group get an award. All finishers receive an event-specific medal. Cost: Adults, 13 and over ($20). Children, 6-12 ($15). Click here to register. Online registration closes 11/21. Race registration is available with a $5 increase to the entry fee. Prizes: There will be an awards ceremony and a superhero costume contest. Click here to register. Registration for the kids fun run ends 11/19. Prizes: Awards for top three male and female performers, as well as age group winners. Click here to register. Race day registration will be available for $30. Prizes: Every finisher will receive a commemorative medal. Races: 5K run/walk, one-mile fun run for kids. All races start at 8 a.m.
Prizes: Awards for top three finishers in each age category and top three costumes. This story originally appeared on CharlotteFive.com.